After the years and looking on the net for some references about IOI'93, I found this great report from Don Piele, USA Team Leader, that I reproduce in its entirety on this page. Our adventure began Friday, October 15, at the Miami International airport where the USA Computing Olympiad team met for the first time since the summer training program at the University of Wisconsin-Parkside. Dr. Harold Reiter, the deputy team leader, flew back from London where he was spending the year teaching mathematics at Kingston University. Team member Hal Burch, 18, flew in from Missouri where he was a freshman at the University of Missouri at Rolla having graduated in June from the Oklahoma School of Science and Mathematics in Oklahoma City. Eric Pabst, 17, came from Salt Lake City, Utah, where he was a senior at East High School, and Mehul Patel, 16, arrived from Houston, Texas, where he was a senior at Langham Creek High School. Yonah Schmeidler,17, a graduate of Ramaz School in New York and now a freshman at MIT, had flown earlier to Buenos Aires and would meet up with us on Sunday. I flew in from Chicago's O'Hare airport after busing down from Wisconsin. Our next stop would be Santiago, Chile with a connecting flight over the Andes mountain range to Mendoza, Argentina, the site of the Fifth International Olympiad in Informatics (IOI). We left the United States at the peak of the fall colors and arrived in Mendoza in the full bloom of spring. We were met at the Mendoza airport by a contingent of college students from Mendoza University whose job for the next ten days would be to guide the participants (273 students and team leaders from 45 countries) to various events within the city and one excursion to the Andes. Their enthusiasm and warmth was infectious. Eric savored the opportunity to try out the Spanish that he had studied for five years, and he quickly established a special relationship with our hosts. His facility in the native language proved to be a big asset for him as well as all the members of the U.S. team. Several times during our stay he would be called upon to give radio and T.V. interviews, talk with the press, help us translate stories that appeared in Los Andes, the local newspaper, and find the beef and chicken dishes in a restaurant menu. IOI participants were housed in two hotels, and our team stayed at the Hotel Aconcagua, named after the highest mountainin the Western Hemisphere, which is located near Mendoza. Fifty Compaq computers were setup on the hotel's second floor for students to use. This was a welcome sight for all teams and a place they often went to 'hash' things over. Similar Compaq computers were housed in the Convention Center, approximately six blocks south of the hotel, where we had our meals and where the competition was held. 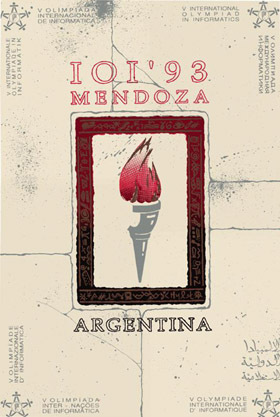 The city of Mendoza had purchased 400 Compaq computers for the event which would be used by the city when the competition was over. There were enough computers around to completely outfit the team leaders' room with a networked system complete with e-mail and printing capabilities. This was a first for IOI and a very appreciated feature of this years' Olympiad. I used it to keep in touch with family and supporters back home. On Sunday evening, we all gathered at the Convention Center for the opening ceremonies. 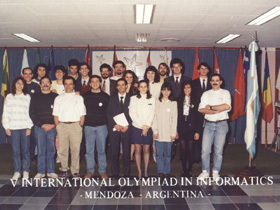 Argentinean officials, including the director of technology in education, the mayor of Mendoza, and the 1993 IOI organizer, Dr. Alicia Bañuelos, gave their addresses in Spanish, which were translated paragraph by paragraph into English, the official language at IOI. A festive mixer erupted soon after with a Latin beat drowning out any attempt at conversation. The young hostesses, dressed in fashionable miniskirts, soon had the young group shaking and stomping to a fast Latin beat. It was non-stop aerobics and survival of the fittest, and I survived by watching and taking pictures from the sidelines. Tuesday was the first day of competition. The team leaders and deputy team leaders were given a wake-up call at 3:30 a.m. so we would be ready for the early morning jury meeting at 5:00 a.m. in the Convention Center. The main order of business was the selection of three problems for the first day's competition. These were selected from a set of nine problems submitted by the scientific committee from Argentina. Besides choosing the problems, all of the non-English speaking countries needed to translate the problem statements into the their language and have copies made for each of their participants. There were approximately 35 different native languages represented, and everything needed to be ready at the appointed starting time. At 11:00 a.m. the competition began, and 155 students went to their personal Compaq 386 machine, identified with a small flag of their country, in one of four different rooms and "started their engines." They had five hours to solve three problems, using one of the officially installed languages: Turbo Pascal V. 6.0, Turbo C++ V 2.0, Quick Basic V 4.5, and LCN Logo V 3.0. We had been working for 6 hours straight in a smoke-filled room, and it was time for a much deserved rest. But before we could relax, we had to remain on call to translate any written questions the students might ask during the first hour. Then we were free to go and get some rest before the judging began. At 4:00 p.m. the competition ended and the students filed out of their rooms with looks of confidence and relief. For the next several hours they would be called back, one at time with their team leader, to have their programs checked by a local coordinator who had been trained to run the programs against a series of input data and evaluate the output file for the correct results. If all runs were perfect, the program was awarded 100 points. Hal and Mehul's programs were flawless and Eric and Yonah's were close behind with 71 and 62. No scores are officially posted for the first day but we quickly learned through word of mouth that a total of 16 students had perfect first round scores. The next day, Wednesday, was reserved for touring a local chocolate factory, followed by a barbecue at the country home of one of the organizers of the IOI. The feast began with trays filled with empanadas, a pastry filled with beef and spices and freshly baked in clay outdoor ovens. One of the special treats in Argentina is to cook large hunks of fine beef very slowly over an open pit. The meat is then sliced off and placed on buns and topped with a special mustard sauce. This makes an excellent sandwich, and the lifetime of each platter full of meat could be measured in nanoseconds. Soon the hosts took to filling the platter and running through the crowd to reach those who were not close enough to see the food before it vanished. As they traversed the lawn, scores of hungry participants reached out and snared their meal and quickly emptied the tray. It took quite a few runs to make it with anything left for the unlucky ones at the other end of the lawn. After a delightful afternoon, we returned to our hotel to get ready for the final round. Thursday morning began at 3:30 a.m. and was a repeat of Tuesday, except that this time one harder problem was selected from a set of three. One problem was eliminated because of its ambiguous wording and the difficulty of making it completely clear in 35 different languages. Almost any problem can have different interpretations depending on how it is translated. For example, does the statement, "all rectangles fall within the borders of an a x b sheet of paper" mean that rectangles can or cannot share a boundary with the sheet of paper? In English, the statement would imply they could be on the boundary but it all hinges on how you translate the word within. Explaining this in 35 different languages can be difficult, so the jury overwhelmingly chose a problem that we believed had no ambiguities. The problem was clear, but one thing we forgot to discuss was how the solutions to this problem would be graded. This, unfortunately, led to a major misunderstanding. This problem quickly became apparent when we walked into the computer room with the coordinator and saw for the first time the rules used to judge the eight sample runs. The first six data sets had a limit of two minutes and the last two a limit of five minutes. Everyone on our team had solutions that ran instantly for the first seven data sets but all ran over the five minute limit for the last and most difficult data set. Since this run was worth 25 points, their hopes for a gold medal vanished as did the hopes for 12 other participants who had perfect scores the first day and also did not optimize for speed. They had fallen into the exponential time trap which for many could have been avoided had they known that, for the first time at IOI, speed would be the deciding factor. Last year in Germany I was surprised to learn that the speed and efficiency of an algorithm was not considered a factor in grading. 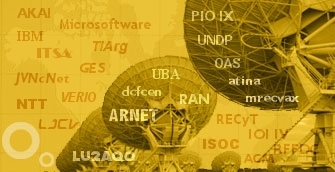 In fact, several programs were allowed to run for hours, even overnight, and others finished in seconds; yet no distinction was made between them. I thought this was rather odd, but everyone seemed to accept this as an unwritten rule of IOI. Students were aware of this fact, and we had told our team members to play it safe and go with any working algorithm and not to worry about speed unless it was explicitly stated in the problem. It never occurred to the jury to ask how the problem would be graded, and when the problem surfaced after the competition was over, it was too late to correct. Many students were well aware that their programs could take years to complete if a large number of data points was used as test data, but since time had never been a factor before, they thought it would not be a factor here. But this was not to be. The jury reacted to this situation by drafting additional competition rules to be considered for IOI'94, including: "When a time limit will be applied during evaluation, it should be explicitly stated in the problem description." Had this been done at IOI'93, it would have helped a great deal. Of course speed of execution as a factor in the grading of solutions is not a bad idea. Since this was the first Olympiad to breach the time barrier, it will now be on the minds of all team leaders as they prepare for IOI'94. The omission, of course, affected everyone equally. The long bus excursion into the mountains of the Andes was reserved for Saturday. Our final destination was Uspallata, a ski resort high in the mountains. Here we were treated once again to the famous open pit beef barbecue done on a grand scale. A wind barrier was set-up around the pit to deflect the strong spring winds rolling off the mountains. The snow was completely gone, and so were all the people. But inside the dining hall, the participants were happy grazing on all the beef they could eat and toasting a local guide whose birthday had been discovered. We soon had to leave to get back to an important jury meeting to decide the cut off scores for the gold, silver and bronze medals. It was a picturesque excursion into a dry, barren and mountainous region. A few were able to drive to a spot where they could view the highest mountain in the western hemisphere Mt. Aconcagua. Hal Burch and Mehul Patel received silver medals and Eric Pabst and Yonah Schmeidler got the bronze. Our team ranked 7th out of 45 in the total number of points and for the first time two girls won silver medals, one from the Czech Republic and one from the Slovak Republic. Gold medals were also won by students from: Sweden, Czech Republic, Bulgaria, Belarus and a United Nations team from Yugoslavia. 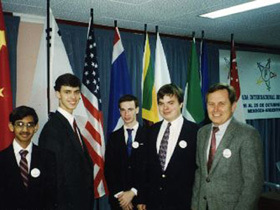 After the jury adjourned, the U.S. delegation was invited to attend a meeting of the International Committee to see when we would be interested in hosting an Olympiad. Countries that had submitted proposals up to 1997 were: Sweden-1994, Netherlands-1995, Hungary-1996, South Africa-1997. Several countries were invited to this meeting to announce tentative plans to submit proposals for years to come. They were: Portugal-1998, Turkey-1999, China-2000, Thailand-2001, Korea-2002. We were also interested in the year 2000 but since China had been a member of IOI longer, they were given precedence over any proposal from a newer member. Since 2003 is too far into the future to make any plans, Joann DiGennaro, director of the Center for Excellence in Education, our sponsor, did not want to make a commitment at this time, and we decided to wait a year and see if the proposal for the year 2000 materializes. The awards ceremony was held on Sunday and began at 9:30 a.m. at the Independence Theater. All medal winners were seated on the stage, with the delegates, other participants and spectators seated in the audience. After the opening ceremonies each team leader was invited to the stage to present the medals to their team members, starting with the bronze and ending with the silver. For the gold medal winners, the students received their award and prizes from local dignitaries from Argentina. The top four students, who were tied at 200 points each, received computers and they were awarded a new IFIP trophy that will go each year to the top student or students in IOI. Pictures were taken as the trophy was hoisted into the air by four excited and deserving young men from Czech Republic, Romania, Iran, and Sweden. The torch was passed to Sweden who invited us all to the 1994 IOI in Stockholm, and the curtain rang down on another successful International Olympiad in Informatics. Thank you Argentina for a wonderful Olympiad. Our memories of your warm hospitality will always be with us. On behalf of this year's USA delegation to IOI, I would like to express our warm appreciation to Joann DiGennaro, director of the Center for Excellence in Education (CEE), who, with contributions from Dell Computers and Oracle, Inc., funded the USA Computing Olympiad training program at the University of Wisconsin-Parkside and the team's trip to Argentina. We are most grateful for the generous support we received from CEE. I also want to thank USENIX, for its financial support of the USA Computing Olympiad, and the University of Wisconsin-Parkside for hosting the USA Computing Olympiad training program on its campus. It was a real pleasure and unforgettable experience to be part of IOI'93. It was a lot of hard work in a short period of time, but it was compensated with a lot of fun and the opportunity to meet great people from around the world and share with them some of our customs and treats. When all the delegations departed and we finished to put the last computer in its box, we were extremely happy for a job well done that would have been impossible without the cooperation of all the members of the different committees, the extraordinary leadership of Alicia Bañuelos, the incommensurable support of the Government of Mendoza and the warmth and hospitality of the people of Mendoza that gave me a chance to be part of an experience that will be forever in my memory and my heart. These pages are dedicated to the memory of Dr. Alberto Mendelzon, President of the Academic Committee and one of my mentors in my profesional career who lost his fight against cancer in 2005, and specially to Diego Baigorria, member of the Technical Committee, a good colegue and friend who passed away in a motorcycle accident soon after our return to Buenos Aires. Click on the pictures above for a larger view or here for more pictures of IOI'93.